A new ordinance will ban people from smoking in some of the parks in Manchester, New Hampshire, lighting up mixed reaction. A new ordinance in Manchester, New Hampshire, is stirring up controversy. There's mixed reaction to the city's decision to pass a smoking ban in some city parks. Smokers are upset. They say a place like Veteran's Park is public and they should be able to use it just like everyone else. "It's beginning to sound like a dictatorship," said Jim Theriault. The Manchester resident enjoys a smoke in Veteran's Park every now and then. 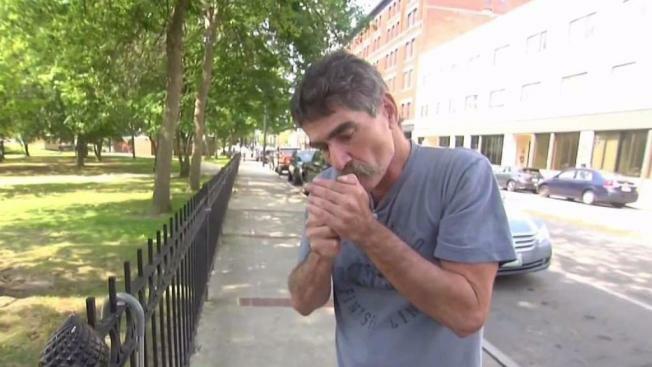 "I'm going to go on the sidewalk and smoke my cigarette now," he said during an interview with NBC Boston. That's because under a new city ordinance passed Tuesday night, lighting up inside Veteran's Park and three other city parks will soon be against the law. "I don't think you have the right to tell people you can't smoke, I am a veteran in Veteran's Park," Theriault said. But for parents trying to enjoy a picnic with their kids, it's a breath of fresh air knowing this public place will be smoke free. "I love it because I can't stand the smell," said Jessica Whiting. "Oh, absolutely especially because I have kids," agreed Amelia Shields. Manchester Police drafted the proposal last month after emergency calls started spiking for people tripping on synthetic marijuana, commonly known as "Spice." "They end up becoming like zombies they pass out in the park," said Lt. Brian O'Keefe. The drug is illegal to buy and smoke in New Hampshire. O'Keefe says this smoking ban makes enforcement much easier. "If an officer is driving by a park, he doesn't know if someone is smoking Spice, a cigarette, or maybe even marijuana, unless they're in close proximity," he said. "But when you ban all smoking at the parks, you can take some enforcement action." Theriault thinks the city went about solving this problem all wrong. "I think they should have dealt with the handful of people that were the problem," he said. "Don't take it out on the whole community." It'll be two weeks before police start enforcing the ban in Veteran's, Victory, Pulaski and Bronstein parks. The first offense will cost you $50, the second will cost $100, and a third offense could land you in a courtroom. After six months, the city will re-evaluate the ban and see how well it's working.